Concept art for the U.S.S. Enterprise from Star Trek: Final Frontier. Art by Brice Parker, via the Star Trek: Final Frontier Official website. We’re finally on the cusp of Star Trek’s grand return to TV with the impending arrival of Star Trek: Discovery, but there have been many attempts over the year to get Trek on TV that weren’t nearly as successful. Here are four times the franchise tried to launch a new show, but failed to make it off the ground. Weirdly enough, the first ever proposed Star Trek spinoff basically had as little to do with Star Trek as it possibly could. Fans of the original series can cast their minds back to the original series’ season two finale “Assignment: Earth,” which saw the Enterprise bring itself back in time to study 20th century Earth, only to be embroiled in the adventures of Gary Seven, a human tasked with protecting the Earth with the help of mysterious alien benefactors. The 1968 episode is a lot more about Gary, his transforming cat/assistant Isis, and their human friend Roberta than it is about Kirk and his crew—the opening titles even end with Gary Seven’s actor Robert Lansing’s credit, the only time a guest star would be credited outside of the end credits on the show. That was for good reason: with Star Trek on the brink of cancellation, Gene Roddenberry was looking to create a new show to air as part of NBC’s fall schedule, and staged “Assignment: Earth” as essentially a pilot he could pitch to executives for a cheaper sci-fi/mystery show to replace Star Trek. Roddenberry wrote a 47-page pitch script for Assignment: Earth that would’ve continued Gary’s mission to protect the present and avoid his own disastrous future, but it made no mention of his origins in Star Trek or the crew of the Enterprise. When Star Trek was renewed for a third and final season, however, plans were quickly shelved. 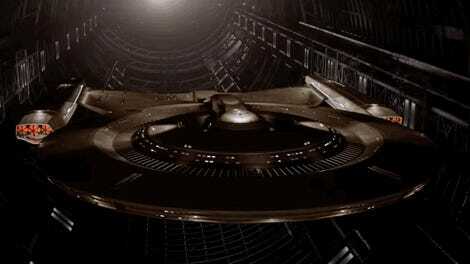 The Enterprise’s new design. Concept painting by Mike Minor, via Memory Alpha. Not to be confused with the movie plans also known as Phase II, this direct follow-up to the original Star Trek series was being developed in the mid-’70s when Paramount were looking to launch a new TV network. With a resurgence in popularity for Trek after the show entered syndication after its cancellation, Paramount decided to scrap plans for a proposed movie spin-off, Planet of the Titans, and produce a new TV show instead. Featuring a refitted Enterprise, a new five-year mission, and the introduction of new characters to the crew—like Vulcan science officer Xon, who would’ve replaced Leonard Nimoy’s Spock, and First Officer Will Decker (who eventually appeared in Star Trek: The Motion Picture)—Phase II entered production with plans for a two-hour pilot and a 13 episode series to air in 1978. However, behind-the-scenes changes, including the fact that the deal of Paramount’s new network fell through, saw the Phase II production downsized—first to a feature-length TV movie, and then in the wake of Star Wars’ surprise success, into a theatrical feature that would eventually become Star Trek: The Motion Picture in 1979. Ideas and concepts from Phase II would live on in early scripts for The Next Generation, but eventually a book containing scripts for the pilot and one of the proposed episodes, as well as a history of the project, was released in 1997 as Star Trek Phase II: The Lost Series. Concept art of Captain Chase by Jeff Parker, via the Star Trek: Final Frontier website. It wouldn’t be until after the end of Enterprise that we’d see another proposed Trek show—but this one would’ve been unlike anything the franchise had done for years: for the first time since Star Trek: The Animated Series, there were plans in 2005-6 to make a full-fledged cartoon set in the Trek universe. Being produced by Zero Room Productions, Final Frontier almost began as a series set in the same time period as the original show, but after CBS expressed an interest in the animated series—initially conceived as a five-part webseries for StarTrek.com, with the potential to evolve into a full series—it was retooled to take place 150 years after the events of The Next Generation. Final Frontier would’ve been set in a period where an explosion of Omega Particles—volatile molecules that could effectively destroy the ability to travel through space at warp, first introduced in Voyager’s fourth season—caused by an unknown force had rendered warp speed travel impossible throughout Federation space, leading to a costly war between the Romulans and a beleaguered, isolationist Federation. In an attempt to go back to Starfleet’s exploratory roots, Alexander Chase, the captain of the Enterprise, would’ve begun a new mission after the war to rediscover the galaxy, hoping to change the Federation’s isolationist regime. Sadly, by 2007, CBS Interactive reshuffled the StarTrek.com staff, firing many and canceling any projects in the works. 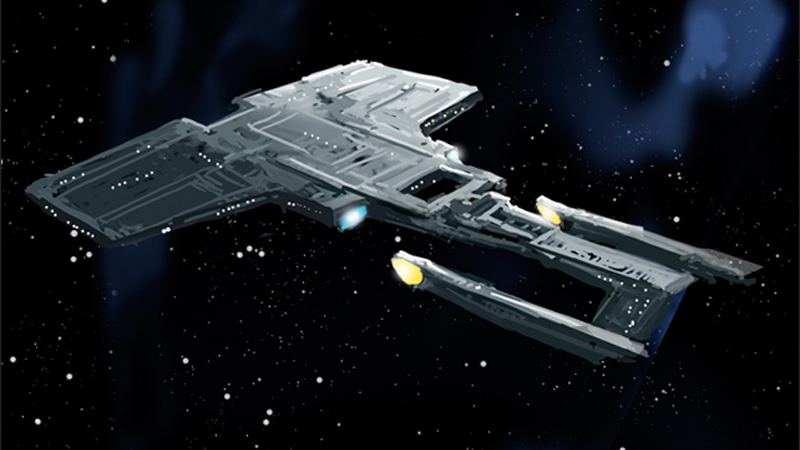 Final Frontier was left in limbo, but the team behind the initial production kept the memory of the series alive by opening the show’s official website, a repository of concept art and information for what might have been. Planned Star Trek Federation logo, by Michael Okuda, via TrekMovie. At around the same time Enterprise ended in 2005, there were also burgeoning plans for another live-action Star Trek show—one that, like Deep Space Nine before it, would’ve examined the darker sides of a future United Federation of Planets. An idea developed by Bryan Singer, Chris McQuarrie, and Robert Meyer Burnett, Federation would’ve been set even further into Star Trek’s future than Final Frontier: specifically, in the year 3000. The Federation would’ve been on a sharp decline, fractured as world after world left in disgust at its human-centric outlook and vast corruption, and with Starfleet stretched thin and poorly equipped. A sudden attack on Federation colonies by an entity known as the Scourge, leaving only Alexander Kirk as the soul survivor, and denial of the attack by the Federation would’ve seen Bajor, Betazed, and even Vulcan leave the alliance. In a galaxy where the Ferengi were a major power, and the Klingon Empire was slowly expanding, the dire state of Starfleet would’ve seen a new Enterprise comissioned, the first flagship in centuries, to promote Starfleet’s ideals of exploration and scientific legacy, while also tracking down the scourge, with Kirk at the helm. The series bible was developed over a year by Geoffrey Thorne, before a proposal was sent to Bryan Singer for polish. But Singer’s final pitch never made to Paramount—while polishing it after he’d finished work on Superman Returns, Paramount announced that J.J. Abrams would be rebooting the movie series, and the Federation pitch was never handed over to the studio. However, details about the series eventually made their way out thanks to a report from TrekMovie.com in 2011. Why Didn&apos;t Gene Roddenberry Get to Make the &apos;Kirk Fights Jesus&apos; Star Trek Movie We All Deserved?